Mollie Cooper, 87, of Garrison, went home to be with the Lord Wednesday, January 16, 201,9 surrounded by her loving family. Mollie was born in Floyd County March 14, 1931, to the late George and Eliza Jane Tackett Johnson. She was a devoted mother, grandmother, and great-grandmother. 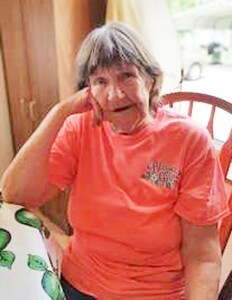 She loved to quilt and enjoyed gardening and especially loved spending time with her family. Mollie was greeted at Heaven’s gates by her husband of 50 years, William C. Cooper; a daughter Dreama Lou Cooper; a granddaughter, Crystal Dawn Cooper; two brothers; and nine sisters. Surviving Mollie are six sons, Gene (Pam) Cooper, Eddie (Betty) Cooper, Nick (Laura) Cooper, and Boyd Cooper all of Garrison, Rick (Linda) Cooper of Bucyrus, Ohio, and Paul (Donna) Cooper of Crestline, Ohio; one daughter, Teresa (Billy) Moore of Garrison; 15 grandchildren; 31 great-grandchildren; and a great-great- grandchild on the way. Services will be at 11:00 a.m. Saturday, January 19, 2019, at Gaydos Funeral Home in Vanceburg with Bro. Clarence Hall and Bro. Wes Cooper officiating. Burial will follow in Cooper-Willis Cemetery at Garrison. Visitation will be from 5:00 p.m. until 8:00 p.m. Friday, January 18, 2019, and from 8:00 a.m. until the time of services Saturday at Gaydos Funeral Home, 159 Second Street in Vanceburg. Pallbearers will be George Cooper II, Nicholas Cooper, Eddie Cooper Jr., Paul Cooper Jr., Ben Cooper, and Shane McCray. Condolences may be sent to the family at www.gaydosfh.com. Condolences may be sent at http://www.gaydosfh.com.